Growth form: Shrub or tree. Flowering. Mar–Apr. Status: Native. Local. Also recorded: Bahrain, E Saudi Arabia, UAE. Habitat & distribution: Occasional in sandy habitats. Although a dominant component of the coastal vegetation over much of the Gulf, it prefers non-saline, fairly deep sand and therefore is restricted in Qatar, mainly to western coastal areas. In NE Qatar it is rare near the coast at Dukhan (John Norton) and locally frequent at Ras Abrouq (Sara Abdul Majid); grazed, stunted specimens have been seen at Al Kharrarah (Renee Richer). Uses: Eaten by camels (El Amin). 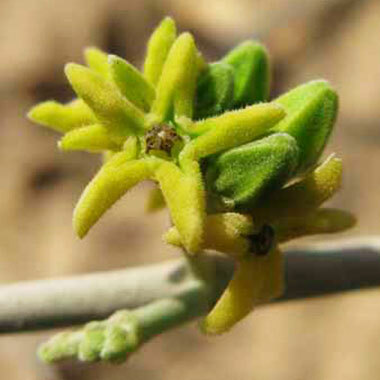 Young flowers and fruits ‘considered edible by southern tribesmen’ (Mandaville). Pickering & Patzelt (2008) note that the buds are edible and that dried hair from the seeds is used as kindling. An infusion made from the stem is taken as a diuretic (Ghazanfar).